Renowned Canadian physicist Eric Svensson, whose pioneering neutron scattering experiments at the Chalk River Laboratories demonstrated the existence of a Bose-Einstein condensate in the superfluid phase of liquid helium-4 and measured the condensate fraction, passed away on May 16, 2018. In addition to his own research, Eric was passionate about the advancement of physics in Canada in general. 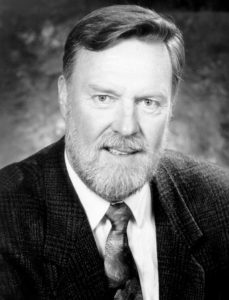 He served for more than 14 years on the Council of the Canadian Association of Physicists (CAP), including Chair of the Division of Condensed Matter and Materials Physics (1993), President of the CAP (1997-98), Director of International Affairs (1998-2002), and Chair of the CAP’s Science Policy Committee (2003-2006). He played a significant role on the CAP’s Committee to Encourage Women in Physics over a period of almost 20 years and received a Special Merit Award from the CAP in recognition of exceptional contributions to the management of the Association in 2003. The CAP is partnering with the Svensson family to establish an endowment fund within the CAP Foundation*. We hope to raise at least $50,000 Cdn to establish the Eric Svensson Memorial Scholarship in memory of Dr. Svensson. Our goal is to permanently endow a graduate student scholarship to honour Dr. Svensson’s legacy, now and for generations to come. This scholarship celebrates the vital role education played in Dr. Svensson’s life, and also commemorates his commitment to the important work of the CAP for the physics profession. Donations in support of this fund can be made by using the links below. All donations are income tax deductible within Canada. * (Canadian charitable registration #83562 7134 RR0001). Fill out the electronic pledge form found at the below link and a receipt will be emailed to you once the payment has been processed. Print and fill out the pdf form (for cheque donations). We thank you for you donation and should you have any questions or encounter any difficulties, please send us an email.